Debbie--have you seen the SPIRIT ANIMALS series published by Scholastic? The series centers on the fantasy world of Erdas where children who come of age go through a ritual to determine if they have a “spirit animal,” a mystical bond between human and beast that bestows great powers to both. As their world crumbles, four children separated by vast distances discover they each have a spirit animal—a wolf, a leopard, a panda, and a falcon. Wow. 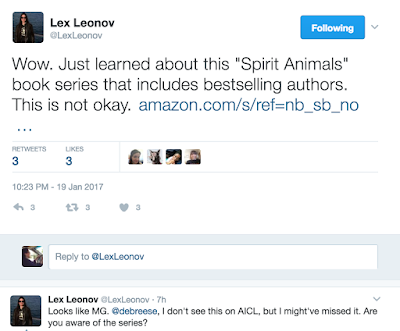 Just learned about this "Spirit Animals" book series that includes best selling authors. This is not okay. Looks like MG. @debreese, I don't see this on AICL, but I might've missed it. Are you aware of the series? "... human and beast that bestows great powers to both." Also in that blurb: "Part engrossing book series, part action role-playing game -- discover your spirit animal and join the adventure." There are so many things wrong with this. Many Native people have already explained why in depth. Research those threads, blogs, books, etc. For these to be published means the most basic research, the most basic respect, was absent. Do. not. do. this. In 2016, Julie Murphy, author of the acclaimed Dumplin' wrote, on her Tumblr, about her decision to remove "spirit animal" from future printings of her book. Refinery29 has an article about Kerry Washington using it, and then apologizing for using it. 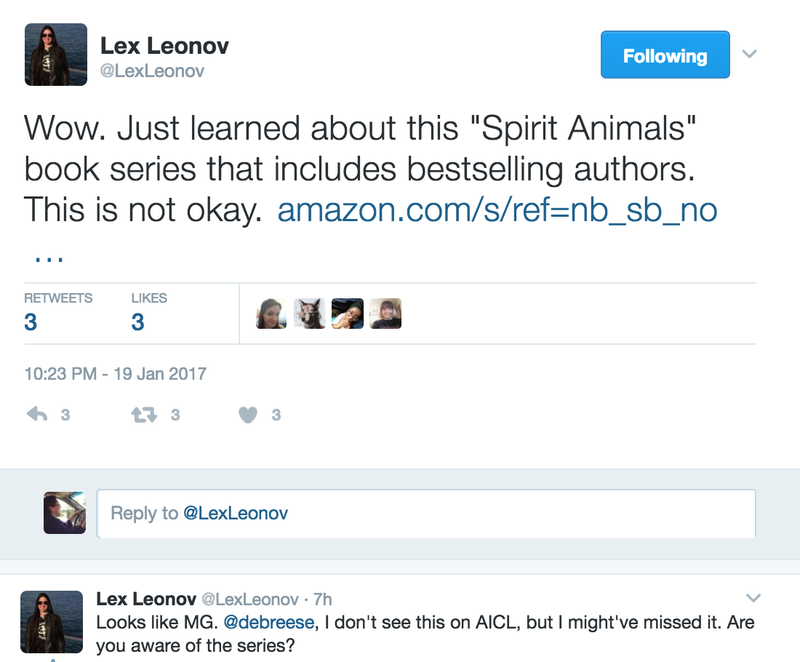 You may think you'll do some research and find out the right way to use spirit animals in your story, but why use it at all? There are other choices. Native ways of being aren't something "cool" for writers to use in their stories, even if their stories are about Native people. If a Native writer, writing from within their own ways, chooses to use it, that's one thing. Others, though? No. It is one of the too-many aspects of Native peoples in the US and Canada that is mis-used, and yes, appropriated. 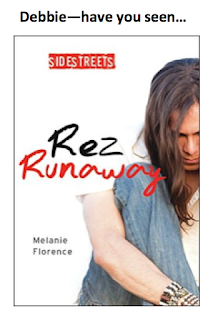 Debbie--have you seen REZ RUNAWAY by Melanie Florence? Raised on a reserve in northern Ontario, seventeen-year-old Joe Littlechief tries to be like the other guys. But Joe knows he's different -- he's more interested in guys than in any of the girls he knows. One night Joe makes a drunken pass at his best friend Benjy and, by the next morning, everyone on the rez is talking about Joe. His mother, a devout Christian, is horrified, and the kids who are supposed to be his friends make it clear there's no place for him in their circle, or even on the rez. Joe thinks about killing himself, but instead runs away to the city. Alone and penniless on the streets of Toronto, Joe comes to identify with the Aboriginal idea of having two spirits, or combining both feminine and masculine identities in one person. He also begins to understand more about how his parents have been affected by their own experiences as children in residential schools -- something never discussed on the rez. And he realizes he has to come to terms with his two-spiritedness and find people who accept him for who he is. I've ordered a copy and will review it when it arrives. There is next to nothing available right now that accurately portrays Native LGBTQ teens. Though emily m. danforth's The Miseducation of Cameron Post is quite popular, the Native parts of it were not well done. That really bothers me! Sometime soon, I'll be back with a review of Rez Runaway. Sometime last year, I received a copy of Melanie Florence's Missing Nimama. It is a picture book, published in 2015 by Clockwise Press in Ontario Canada. I didn't read it, then, because it didn't feel right. The subject of the book is Missing and Murdered Indigenous Women. I also got a copy of her young adult novel, The Missing. I tried to read it, but after a few pages, set it aside. I look at both of her books with the reality of Missing and Murdered Indigenous Women (MMIW) in mind. Regular readers of AICL know that I think it is important that children have books that mirror their lives. Regular readers also know that I think it crucial that we have books by Native writers who are writing from their own experiences and knowledge of our lives, past and present, in countries whose genocidal policies sought to eliminate us from our homelands. So, it might seem to AICL's readers that I'd welcome these two books by Melanie Florence. I do not. Indeed, I do not recommend Missing Nimama or The Missing. It has been a challenge for me to articulate why I felt resistant to these two books. The prompt for a writing contest helped me figure out why I felt that way. On January 10, I saw an announcement for a writing contest for children. 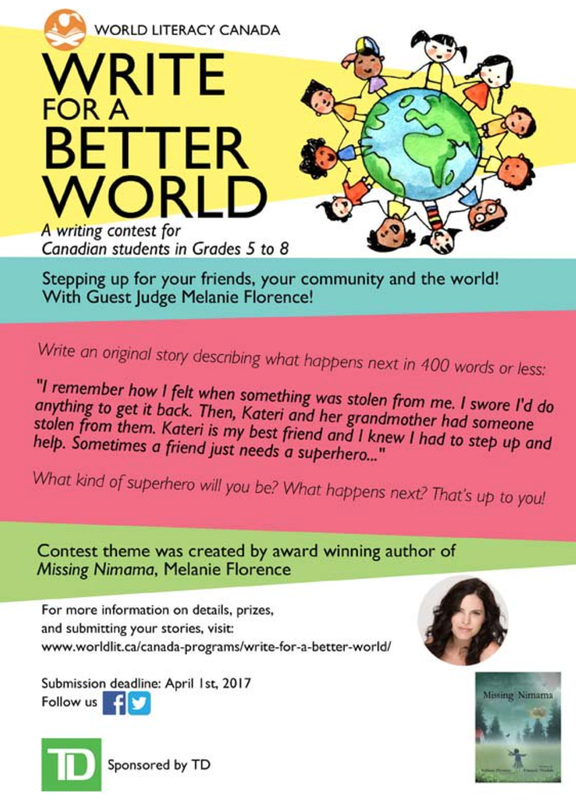 Sponsored by World Literacy Canada, the judge for the contest is Melanie Florence. The prompt for the contest was written by her. To the right (below) is the poster that circulated. To the left is the text of the poster. Stepping up for your friends, your community and the world! With Guest Judge Melanie Florence! "I remember how I felt when something was stolen from me. I swore I'd do anything to get it back. Then, Kateri and her grandmother had someone stolen from them. Kateri is my best friend and I knew I had to step up and help. Sometimes a friend just needs a superhero..."
What kind of superhero will you be? What happens next? That's up to you! Contest theme was created by award winning author of Missing Nimama, Melanie Florence. I was stunned by that prompt. How, I wondered, could anyone equate "something" that was stolen to "someone" that was stolen. In writing the prompt as she did, Florence characterized Native women who were missing, or who had been murdered, with something a child might have lost. Clearly, a Native child whose mother was missing or murdered would not fare well in a classroom where a teacher put that prompt on the child's desk. Clearly, Florence was not thinking of Native children when she wrote that prompt. How could Florence have written a prompt like that? Her website tells us she has "Cree heritage." What--in the midst of on-going conversations about Joseph Boyden's identity--I wonder, does "Cree heritage" mean? Does her use of "heritage" suggest she isn't living her life as a Cree person who hangs out with Cree or First Nations communities? Is a remote connection, where that heritage is an abstract concept, responsible for her being able to equate a stolen item with a stolen person? It might be. As many have written, during these weeks of discussions of Joseph Boyden's identity, many Indigenous people in Canada who, as children were taken from their families, struggle to reconnect with their respective families and nations. It is difficult for many of them to reestablish those connections. Some have not been able to make that connection. If that is Melanie Florence's story, it would explain (to me) how she was able to write that prompt--and these two books, too. Introducing our new story prompt! moved away from her family. Does that revised prompt tell us that Florence's two books about missing and murdered Indigenous women and girls are not stories from her own experience? On the opening page, we see Kateri, a little girl in bed, asleep. She's dreaming of leaning against her mother while her grandmother tells them stories. We read that when she wakes, she'll lose her mother, all over again. The review at Quill and Quire said that the story is touching. That image--of the little girl waking and losing her mother all over again--is a good example of how the story might be called touching. That tug-on-the-heartstrings quality is present throughout the book. To me, however, it is like the prompt for the writing contest. Rather than losing a mom all over again when she wakes, a Native child reading this book (or listening to it be read aloud) in a classroom, may be inadvertently traumatized by a teacher who may not know the child's history. As with the prompt for the writing contest, it feels like Florence did not imagine Native children as being part of her audience. Taken from my home. Taken from my family. My kamamakos. My beautiful little butterfly. I fought so hard to get back to you, Kateri. I wish I could tell you that. And when I couldn't fight anymore, I closed my eyes. And saw your beautiful face. "Fought so hard" and "couldn't fight anymore, I closed my eyes" --- that's horrible. Kateri's mother, we know, is dead. We have a murdered woman, speaking, telling her little girl, what happened to her. Would you do that, if you had been murdered and could speak to your child, or a child? I couldn't. I wouldn't. Would you? "Your mother is a beautiful dancer, Kateri. Just like you." Dark in the room he took me to. Dark when he left me. And so dark after. I never saw a light or a tunnel. Only darkness. Until my daughter's voice called me back. What does that do to a child whose mother is missing? Native or not, isn't it just plain wrong to give that child this book? Later, when Kateri is an adult, she goes to gathering where people are carrying signs about missing and murdered women. On that page, Francois Thisdale (the illustrator for Missing Nimama), has likenesses of photographs of missing and murdered women. I look at them and wonder if he used actual photographs to create those likenesses, If so, did he ask permission to do that? If not, it seems a violation of those women and their families, too. who flew to the phone every time it rang. that her mother was coming home. The phone rang today. I didn't run. "We found your mother," they said. But I knew she was gone. I had known for years. Touching? Perhaps. Appropriate for children? No. That's where I end, with Missing Nimama. It is a picture book, which suggests it is for children, but the content renders it inappropriate for young children--or for children in the 5th through 8th grade (the World Literacy Canada writing contest is for children in those grades). It is where I end, too, with The Missing. I won't read it. I can't read it. The violence we experience is real. Not abstract. Not appropriate subject matter, unless, maybe it is told directly from someone who has experienced it. Florence won a major literary award for this book. It is the TD Children's Literature Award, which is $30,000 given to the book that is "the best of the year in Canadian children's books." To me, however, Missing Nimama and the writing contest strike me as something Canadians can wrap their arms around, to feel like they're facing and acknowledging history, to feel like they're reconciling with that history. But are they, really? I read writings from many Indigenous people in Canada. Most feel that reconciliation has become a shallow gesture. It is superficial. It is a token. Empty. Meaningless. Something they can cross off their list and move on, as they were before. Of course, that is far from ok.
To me, it is asking Native people to perform a tragedy on Canada's 150 stage. To many, this review of Florence's work will feel harsh. Most people are likely to disagree with me. That's par for the course, but I hope that other writers and editors and reviewers and readers and sponsors of writing contests will pause as they think about projects that involve ongoing violence upon Native women. For your convenience, I am adding comments from Native writers and scholars here, as I receive them. Wow. I am shocked at the author equating something stolen (anything, really) with murdered and missing Native women. I am also very tired of people claiming to be Native (this isn't about enrollment) to get published or be seen as credible Native storytellers. If you have "heritage" it would be wise to let the readers know who your relatives are. I wanted to share my concerns about Missing Nimama and The Missing by Melanie Florence. Firstly, I'm concerned about such a mature topic being addressed in a children's book. MMIW is specifically about how native women and girls are targeted for violence and face systemic racism in the justice system. MMIW is not only an issue of violence against women and it cannot be minimized into the story of a girl finding out her mother was murdered. I don't think children this age are able to grasp these social power dynamics. I think most teachers would be unable to confidently field questions on MMIW. Second, the author's use of violence against Indigenous women is gratuitous. This is a terrible book to teach about MMIW because Melanie Florence specifically writes Kateri's mother to die. The mother is written as a disposable, one-dimensional character that haunts Kateri like a ghost. Even when Kateri gets the call that her mother has been found, we are again reminded that Kateri's mother's death was inevitable and expected. Both of these assumptions tie into the very reason why Indigenous women and girls are being targeted for violence. As someone that has attended Sisters in Spirit vigils and MMIW events for years, Melanie Florence's narrative is in direct opposition to the way families of MMIW feel and speak about their loved ones. In fact, a major critique of families of MMIW is the dehumanizing way the media reduces the entire life of a woman into a headline of her violent death. Thirdly, this is a very inappropriate book for any child who has been impacted by MMIW. A native child in particular would naturally relate to Kateri, including adopting the guilt and violence that Kateri experiences. These are unnecessary and traumatic burdens to place on a young reader. For all of these reasons I find both the author and awards committee don't fully understand the issue of MMIW. The family's of MMIW have led this movement for decades and I seriously question why their voices aren't present and their concerns aren't addressed. Finally, this author seems to use a vague claim on Cree heritage as a blank cheque to write whatever she wants about native people. Similarly to Joseph Boyden, there are specific places in the book that mash-up culture references from very different nations. I would suggest having indigenous jurors if you are going to be handing out awards for indigenous works.